Keith Collantine has written an excellent article on the unwritten rules of F1. 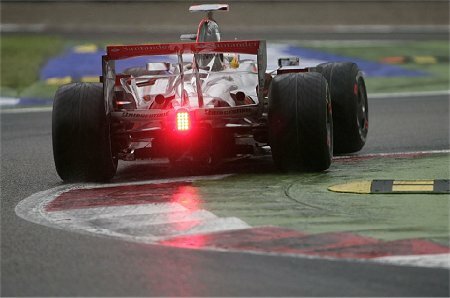 He includes an occasion previous to Hamilton's penalty at Spa where the stewards "clarified" a rule after the event - de la Rosa/Schumacher at Hungary in 2006. It is quite clear that the stewards will interpret a rule in any way they want and then add to the existing rule to justify whatever action (or lack of it) they have taken. In effect, this amounts to applying rules in retrospect and penalizing drivers for rules that were not in existence at the time the alleged offense was committed. That is not a healthy situation for the sport and is bound to lead to accusations of bias on the part of the stewards. If the unwritten rules are as easily defined as Keith has done, I can see no reason why they should not be added to the sporting regulations so that everyone knows what is and is not legal. One is tempted to suppose that they are not written so that the stewards can continue to affect the results of races (and therefore the championship) as they please. It is much harder to argue that a driver should wait a corner after giving back an advantage if that is not included in a written rule. There is much that needs to be clarified if the stewards are going to hand out penalties in terms of section 30.3(a) of the sporting regulations. If it is illegal to depart from the track during a race, we need some sort of definition of what constitutes the track and what does not. The recent GP at Monza gives numerous examples of cars leaving the track and yet not being penalized for it. The second section of the Variante della Roggia, the second chicane, was cut consistently by all competitors throughout the race. The plain fact is that it has to be cut if a decent lap time is to be attained. But that should not affect our view of the regulation - if the white lines edging the tarmac surface of the track are taken as the boundary of the track, all cars offended against the rule. This leaves us with the problem of defining exactly what amounts to cutting the chicane; where do we draw the boundary and say that, outside this line, you are cutting? It seems to me that the most obvious and fairest route is to use the white line as the threshold between track and outfield. The kerbs are there for safety purposes and to give the drivers some leeway in cornering - they are not intended to be a method of straightening a corner that has been designed to be a part of the track. In my humble opinion, therefore, the rule should be that having all four wheels outside the white line amounts to leaving the track. We can say that this is impractical in the case of della Roggia since, by my definition, all cars left the track in the second section, but that is a fault in the design of the chicane, not my rule. Like many chicanes, della Roggia is far too sharp for modern F1 cars and would slow the racing to a ridiculous extent if taken by the book. The answer is to ease the worst chicanes so that they can be taken at something approximating racing speeds, rather than forcing the cars to come almost to a stop. The arguments over Massa's overtaking move on Rosberg show very clearly why a definition is needed. I happen to think that Massa did cut the chicane to complete the pass on Rosberg but many do not. If "leaving the track" were precisely defined as I have suggested, there would be no argument - a quick look at the video would be enough to see whether any of his four wheels had been outside the line and that would give us an answer. To my mind, it seems that, before we can thrash out some sensible written rules on what should happen in the event of chicane cutting, we should define exactly what we mean by cutting. The recent events in Spa have highlighted just how devoid of rules F1 is in this area and there seems no reason why rules should not be written into the book to cover all foreseeable circumstances. When borderline cases occur, clarifications can be added, but not with prior effect - as we have seen, that leads to suspicion of bias on the part of the officials. I have often written in this blog to the effect that the rules need simplifying rather than more complication. That was in relation to the technical regulations, however - somehow a rule that states only that the race shall take place on the track seems an over-simplification to me, especially when it is enforced apparently randomly and is subject to the opinion of those judging the issue. To me, the existing conventions for racing etiquette look far too much in favor of the driver in front, especially in a sport that is crying out for more overtaking, but to have them written into the rulebook would at least be a start in the task of ensuring fairness for all. They can be amended as and when we find ways to improve them. But, with unwritten rules subject to interpretation at the whim of the stewards, there are bound to be controversies forever. Bernie Ecclestone may consider that good for publicity but there is no way it is good for the sport. Let the FIA get writing. There is no better example of drivers leaving the track than the exit of Ascari on to the back straight. There is a section of tarmac with an advert painted on it which for years has been viewed as fair ground despite it being outside the line. By the definition in the rules every car that has raced at Monza for the last decade and then some has been deserving of a penalty but none has ever been given. The drivers use this piece of tarmac for one reason. It gives them a sporting (unsporting) advantage. They can carry a faster exit speed out of Ascari and hold that advantage all the way to Parabolica. They may not gain a place by doing so but it stops someone behind from taking the place. If the track edge was enforced as such the exit of Ascari would reward ability and judgement as it is what should be an area where the skillful gain is simply somewhere where everyone plants his right foot. Exactly, Steven. In fact, there is a corner similar to Ascari on almost every track on the calendar - where we have become accustomed to seeing cars take advantage of the run-off area at the end of the corner. One could legitimize it by extending the line to include some of the run-off but then drivers would just take another bite of the run-off to maintain even greater speed through the corner. The obvious answer is to accept the white line as the edge of the track and insist that drivers keep at least one wheel within it at all times. It would slow lap times marginally but that would be the same for everyone - and there would be no more arguments about what is allowed and what is not. I am surprised someone as safety conscious as Max hasn't noticed that this takes the drivers closer to the wall which on a painted surface in the wet especially should be discouraged. It means the drivers carry more speed into the Parabolica braking zone and it limits overtaking. It is wrong for so many reasons. I do't know if it still applies but the rule in CART used to be that the driver was only allowed to put two wheels over the line which meant in reality the inside edge of the outside wheel was running along the line. Put a third wheel over the line and you got a penalty. So, once again, we have to look at an American series to find sensible rules for F1 to emulate. I think there is no shame in taking the best from other series to improve F1 but, if the FIA insist on being so superior in their attitude, they should at least provide the sport with rules that are clear and not open to interpretation. Only then can they continue to claim that F1 is the pinnacle of motor sport - at the moment it seems to be the pinnacle of obscure and irrational decision-making. As David Coulthard once said"Upwardly sloped run off area,s"I for one dread the thought of Marshalls shovelling with there hands to uncover an upturned drivers head in the gravel trap,while everyone around them ignores the waving yellows,then Eddie Irvine would say"If there was an Armco there"I would reply "Well i might not be hear to moan about it"F 1 really,as you say,needs to define the playing arena,because without a level playing field,what use is the game?. Sorry Clive I should of elaborated,when asked how do we avoid accidents like Alex Wurz,s spin through the gravel trap in the Benneton at Nurberring?Coulthard replied "sloping run off areas"I thought it made so much sense,why subject the car and driver to a sudden and excessive change in environment when He can just spin and recover and fight another day,but now we are seeing drivers use it as part of the track.Now do we revert back to the days of gravel traps,or do we install Armcos,or are we likely to see some sort of bizarre flag waving,counting corners sort of racing were you only know whats going when you come to sites like this. I have always hated chicanes. Either put in a proper turn, like Ascari or several at Silverstone, or leave the track alone. As for cutting the chicane, put in curbs that you can't run over. These are the supposed greatest drivers in the world, after 1 or 2 DNF because they broke the car hitting the curb, they will slow down and take a more precise line. They manage to deal with the Wall at Montreal. 2 of my favorite moments in F1 were seeing MS hit the wall at Montreal and clout a curb at Monaco breaking the suspension while leading comfortably. He never did either a second time though. I agree with what you're saying; this whole "cars cannot leave the track" and "cars cannot block" business needs to be in firm writing. The photograph put here is excellent for illustration because I already commented that part of the letter of law must be a clear definition of "what space is the track". The law must also define what constitutes leaving the track: above, Hamilton's car is still on the track with its left side wheels, so must the entire car leave the bounds (as the entire ball must leave the bounds in football) or are you off the track when a single little winglet goes over the line (as in basketball)? The law should also define the punishments for the infractions, but that was a different article. Lonny: The matter of kerbs is one area where the problem could be dealt with in a practical way to discourage corner cutting. Some circuits have kerbs that you attack too aggressively at your peril - they will throw you off the track or break the car more often than not. So it should be possible to install that sort of kerbing at all circuits. I still worry about safety, however. At times mechanical breakage or a deflating tire throws a driver into a chicane too fast to negotiate it and it should then be possible to safely use the run off area to avoid a serious accident. Steeper kerbs are likely to launch a car into the air and that is when the worst accidents happen. Chunter: I chose that particular photo because it illustrates the fine line between the track and the "non-track" if my suggestion were to be taken up. If we look at the line of Hamilton's progress through the corner, it would seem that his left rear tire has followed the edging line - and that, in my book, would be legal but cutting it fine. If the tire had crossed the edge of the line and been on the kerb entirely, that would be illegal. It would then come down to a matter of how close to the limit drivers were prepared to go and this would favor the exceptionally precise drivers like Hamilton. Anyone who has seen how Hamilton flirts with the walls at places like Monaco and Indy knows just how good he is at car placement. And isn't that what we want - that the best drivers should win? The areas behind the curbs should be made of steel and the cars should have large rare earth magnets underneath. Otherwise make the curbs increasingly hostile the further out from the track they get. "The cars must race on the track" sounds like it might once have made sense, before being put through a series of on line translators. It's no use having a thousand rules if they are incomplete, ineffective or unintelligible. It is unbelievable that a sport generating as much as F1 does, has such an amateurish rulebook. The rule makers make nets for the safety of the drivers. The drivers and designers ignore the purpose of the nets and try to use them to advantage. This is probably as old as the first rule. I like the idea of "increasingly hostile" curbs - it would then become a matter of driving skill in judging just how much of the curb to take. It would give the cars with greater ability to absorb bumps an advantage but that is already so anyway. And yes, there is a perpetual war between the rule makers and the engineers - that is an important facet of the sport! The de la Rosa/Schumacher 'clarification' is crazy - I hadn't realised until reading Keith's article that the stewards had actually tried to justify this one. Essentially, if you're ahead you're allowed to cut the corner to retain the lead (although even after the clarification it's not clear when 'ahead' is defined - before braking? At turn in? Just before the defending car leaves the track?). So if a driver's position is under threat coming up to a chicane, all the defending driver needs to do is ensure that they remain ahead (which should be easy enough if you're not actually going to have to brake enough to make the turn) and then straight line the actual chicane, maintaining the lead. I'm surprised we didn't see this employed at Monza - seems like the perfect 'one-off' defense to me. Either the drivers are being very gentlemanly about it (not likely) or perhaps they still think they are risking a penalty despite the original clarification (which I think is entirely plausbile given the level of consistency around these decisions). In any case, I can't believe how the stewards at the time came to the conclusion that this was a sensible interpretation of the rule - it definitely has the feel of a case of not wanting to issue the penalty and then trying to come up with the reasoning after the event. A quick two cents to agree with the idea of hostile curbs, in fact, let's change the tarmac runoffs to the sort at Paul Ricard circuit; the kind that gradually destroy tires. This design will discourage overuse. The problem with the "how far over, outside the line is he" line of reasoning is that someone (presumably a marshall or corner worker) must observe the infraction and then call it to the attention of: The STEWARDS! Then we're right back where we started. Progressive curbs or tire destroying curbs sound like a much better idea, absolutely impartial enforcement. Al: I agree completely with what you say. The stewards set a completely idiotic precedent with the Schumacher/de la Rosa decision, apparently because they did not want to penalize Schumacher. But they are fairly safe in doing so - since they are able to "clarify" rules as they like after the event, there is no guarantee that they will see things the same way next time. My point is that, if the FIA is going to start pointing at article 30.3(a) of the Sporting regs as an excuse for penalties, they must define what is the track and what is not. Otherwise "leaving the track" will remain forever a matter of opinion and the stewards will be suspect for every decision. But the FIA will not do that, of course. It would make an immediate nonsense of previous decisions, such as the Schumacher/de la Rosa incident. As regards the polystyrene blocks at the first chicane at Monza, notice that Webber, after his wheel-bashing incident with Hamilton, straight-lined the chicane and negotiated the artificial block chicane on the run-off. It shows just how silly that first chicane is in that Webber emerged on to the track well ahead of Hamilton, who had negotiated it legally. Slow the cars, yes, but don't do it with chicanes so tight that the cars can only negotiate them by riding the kerbs. Chunter and Lonny: You are actually pointing at another weakness in the rules in that penalties are not specified for particular offenses and so the stewards can be wildly inconsistent in penalizing similar incidents (they can even invent penalties when they are laid down in the rules, as we saw in Valencia). Whilst I am generally in favor of having fixed penalties for each offense, fairness demands that the rules be much more detailed before this happens. As an instance, in Spa Hamilton was forced to cut the last section of the chicane because Raikkonen moved over on to his line. How fair would it be to penalize him for leaving the track in those circumstances? And would not this encourage the driver who is slightly ahead to push his competitor off (ignoring the fact that precedent already gives the leader enormous advantage in this case)? To some extent, we will always have to take circumstance into account when judging racing incidents. If we are saying that it's fair for a driver in the lead to force another driver off the track, we cannot then penalize the second driver for not staying within the kerbs. That requires a certain degree of impartiality from the stewards but should we not be demanding that this be the only criterion in their selection? By definition, the stewards should be as unbiased (and unaffected by political pressure) as humanly possible.